A good trader is willing to learn all that there is. There are abundant traders who actively undertake trading activities. From these, some become more successful as compared to others. These traders - the ones who become successful - possess a plethora of techniques, styles, and trading habits. Although these characteristics differ from one another, a few traits are in common. 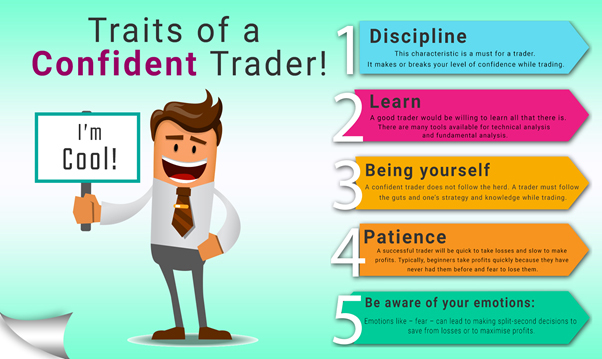 These attributes not only make them a confident but also a successful trader. This characteristic is a must-have for traders. It makes or breaks your level of confidence while trading. It does not mean that a trader has to devote all his/her time towards the stock market, or the derivatives market, and so forth. It only says that a trader has to be committed towards the activity and engage in it with discipline. A good trader would be willing to learn all that there is. There are many tools available for technical analysis and fundamental analysis. A good trader, even if he/she wouldn’t be needing these tools extensively, would be willing to learn. A confident trader keeps up with the market and technology. Another dominant trait is that a confident trader also gains from the losses. Every trader is bound to lose a certain amount of money because that is how the market works. A confident trader is one who believes that there is knowledge even in losing money. Good traders also learn about themselves. They will know how their trading activity might get hampered by changing circumstances, emotional stress, tiredness, etc. It is better to pull back when your head is not right. A confident trader does not follow the herd. A trader must follow the gut, strategy, and knowledge while trading. These actions must be in line with the financial goals. Reflect on yourself, see what your risk appetite is, and see if you are willing to go for a particular trade with conviction. Prepare a financial plan and follow it. Being yourself is a key trait of a confident trader. Wealth is not built in a day or a week – it is slowly accumulated over time with consistent strategies. A successful trader will be quick to take losses and slow to make profits. Typically, beginners take profits quickly because they have never had them before and fear to lose them. It becomes crucial to stick to the plan, keeping calm, and accumulating step by step. We discussed that confident traders learn about themselves. A large part of it includes knowing their feelings and knowing how they can affect their trading habits. Emotions like fear can lead to making split-second decisions to save from losses or to maximize profits. Anxiety can cause one to make a premature exit before the exit signal. Alternatively, avoid making the trade altogether. Every coin has two sides; and one side sees greed, excitement, and over-confidence. These emotions can cause the exact opposite, and let you hold onto a position for too long. The last thing that one can do is to have accurate trading records. These records would help avoid making the same wrong decisions further. Also, these records would help to show earnings/losses for tax purposes. A confident trader bears the aforementioned characteristics, and this helps him/her become successful. Where do you stand on these traits?